UPDATE Sunday July 9, 2017 – The article below was originally published on March 28, 2016. According to social media post from this weekend the street team was spotted back in the area. A controversial “country rap artist” street team was spotted in Watauga County and the region over the weekend. 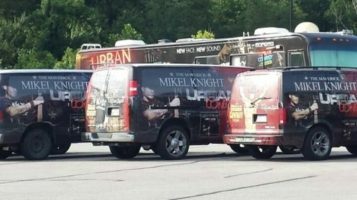 The musician known as Mikel Knight and his street team have been traveling the country for well over a year stopping in various town and cities to sell CD's, usually with high pressure tactics to shoppers in parking lots and gas stations. The team, which is a fleet of tour vans and buses wrapped with the artist name and photo, have received a lot of complaints across the country for their aggressive sales style. At previous stops various media outlets have reported that they are usually in town for just a few short hours, usually managing to leave before law enforcement can question them. According to social media reports the vans were spotted in several locations in Watauga County and in West Jefferson, Lenoir, Elizabethton, Roan Mountain and Mountain City. A google search reveals the musician does not have a record label or any 2016 tour dates. A website called Saving Country Music noted that in May of 2015 five members of the team were arrested in South Dakota for selling CD's without a proper peddler's license. An article on the website provides a lengthy account of the controversial nature of the musician and his team.